Researchers around the world have expressed concern and alarm about HR 3699, the Research Works Act, which endangers the public’s access to federally-funded research — to research funded by taxpayers’ own contributions. A number of scientists and mathematicians have signed an online pledge at the Cost of Knowledge saying that they will not publish or do any editorial work for Elsevier, the world’s largest publisher of scientific journals, which has declared its support for HR 3699. A January 21st blog post by Timothy Gowers, a University of Cambridge mathematician who has won the Fields Medal, math’s equivalent of the Nobel Prize, voiced the views of many about Elsevier. “Why do we allow ourselves to be messed about to this extraordinary extent, when one would have thought that nothing would be easier than to do without them?” Gowers wrote. The online pledge surfaced after a few days and has been signed by over 2,400 biologists, social scientists and mathematicians. The reasons for the boycott are far from academic. The National Institutes of Health made all federally-funded research publications openly accessible in 2008. But HR 3699, which is sponsored by by Rep. Darrell Issa (R-CA) and Committee member Rep. Carolyn Maloney (D-NY), proposes to limit access, based not on who has funded the research (the public or private sector), but by defining research as “private-sector work” based on the “intent” of an author, i.e., the researchers. The American Association of Publishers – self-described “private-sector research publishers” — support HR 3699, on the grounds of seeking “regulatory interference” about the research they publish. Currently, scientists, mathematicians and others strive to publish in certain highly regarded peer-reviewed journals. They of course wish to make the results of their research known to the public. Getting an article published in a peer-reviewed journal involves a number of stages after submitting an article: The manuscript is sent to reviewers who are other researchers and who, very often, hold academic positions at universities. The journal’s editorial board makes the decision to publish the article or not. The reviewers are not paid by the journal. However, to read the research in a journal, you have to have a subscription to it, or to belong to an institution that has one. Elsevier publishes over 2,000 scientific journals including two that are very prestigious, The Cell and The Lancet. Scientists must be familiar with and cite research published in such journals; for researchers who are junior faculty at universities or in post-doctoral positions, getting research published in these journals can make their careers. First there are the prices. Then the company bundles subscriptions to lesser journals together with valuable ones, forcing libraries to spend money to buy things they don’t want in order to get a few things they do want. And, most recently, Elsevier has supported a proposed federal law, the Research Works Act (HR 3699), that could prevent agencies like the National Institutes of Health from making all articles written by grant recipients freely available. In calling for a boycott of Elsevier, researchers are more than aware that they are the suppliers of content to the journals. Without scientific research, you can’t really have a scientific journal. Scientists are attempting to publish without the likes of Elsevier and other private-sector publishers at sites including F1000 research and the arXiv, at which physicists and mathematicians can post work in progress. Such “instant publishing” is still in its infancy as a valid, and validated, venue for scientific research. But I commend these researchers’ intentions and efforts. I’m an academic at a small, chronically under-funded urban college. We don’t have access to a number of publications because the subscription costs are just too high. My college is not a research institution but the more research that is available via open access, the more our students — the more that anyone — can benefit. Like Michael R., after reading the comments, I feel like a candle has been lit. Lets hope the tide has turned. The results of publicly funded research must be open to the public, and not only in the "corrected", probaganda-ised form issued by the IPCC and other New World Order bodies. This administration has returned to grounding policy based on science rather than political myths and other foundations; thus those who prefer myths want to keep the scientific results from becoming known to be used for such policies--really scary stuff. Thanks for the information: some very good points were made here. I'm happy to have received this article in the same e-mail as the one on pseudoscience: how can we assess issues intelligently if accurate scientific information is held hostage by high fees and, now, potential federal legislation? Those promoting pseudoscience are more than happy to monopolize the mass media. Car thief-turned-Congressman Darrell Issa is, and always has been, for sale. That in itself should tell you the reason for limiting access through HR 3699. How arrogant, anyway, to tell the populace to pay for a book to be written, but deny them the right to read the book. Another article in defense of the "reality based community" today. On a form that all to often caters to the mythologies of the left. It's as if someone lit a candle and the world isn't quite so dark. More bullying by the GOP. Instead of trying to pass a piece of road apple like HR3699 and restrict or censor, we should build something positive. 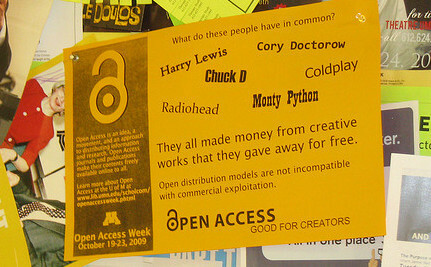 The Open Access movement combined with a simple royalty system allowing people to pay how much they think it's worth to support the original authors would be far more acceptable than HR3699, ACTA, OPEN, SOPA, or PIPA; we should also abolish DMCA. As long as their experimentation is not on animals OR the stupid myth of Global warming, Then I could care less other than using our tax dollars to do so. If they feel their research is that important , then let them pool their resources as there are many experimentations that are a waste of tax payers dollars, including the fact that we have no say so ultimately on what is utilized experimentally. They think someone will run with the information and get paid for what they deduct...it is a money thing. They think someone will add or subtract from what is published, make it their own and make some money off of it...GREED is the final deduction. IT ALWAYS COMES DOWN TO GREED!